For the first-time ever an England World Cup qualifier will be shown only on the internet, after broadcasters failed to bid for the football match Setanta once owned. As TechRadar informed you last month, the upcoming qualifier between England and the Ukraine had the potential to be web-only, with digital sport specialist Perform gaining sole rights to the football match online and no one in line to buy the TV rights. Since noboody has stepped forward to televise the football match, you will now only be able to watch it on the internet. Although England have already qualified for the 2010 World Cup held in South Africa, the lack of television coverage will be a blow to those who like to catch the national team on the television. 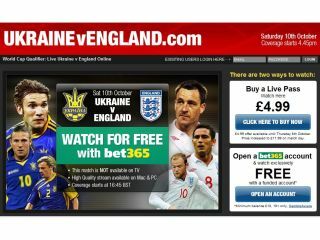 It's good news for web aficionados, though, as www.ukrainevengland.com will be the only place to watch the match. There is a price to pay, however, with virtual tickets for the match going for a minimum of £4.99. The price rises the longer you leave it to purchase one, with the price becoming £9.99 on Thursday, and the game costing £11.99 if you log-on on the day (Saturday 10 October). Speaking to BBC Sport about the online match, Peter Silverstone, Managing Director of Kentaro, said: "You will watch it as you would any other stream on the internet, like YouTube or the BBC iPlayer – there will be a pop-up player that will show the match in a very good quality stream." When it comes to commentary, the whole team is yet to be announced but it is said that Sven-Goran Eriksson will be in the studio for a natter. "Whilst armchair fans may be disappointed that no TV broadcaster has stepped in to acquire the broadcast rights to this match, it is an opportunity for broadband users who have never watched TV online to broaden their horizons and experience what an internet connection can offer beyond the usual surfing and emailing." Philips does have certain reservations, especially with those looking to catch the game on a mobile phone, stating: "Watching the match is likely to use around 1GB of a broadband user's download allowance. Whilst this isn't that significant in total terms, it could push some users over their monthly limit so we'd advise footy fans to check first so they don't end up being penalised. "Those planning to watch via mobile broadband need to be particularly vigilant since over-usage charges can be massive." If you don't fancy watching the game from your armchair, then the Odeon cinema chain will be showing the game at 11 venues across the UK. This includes the chain's flagship venue at Leicester Square in London.